Beef and Vegetable Mung Bean Noodle Bowls! 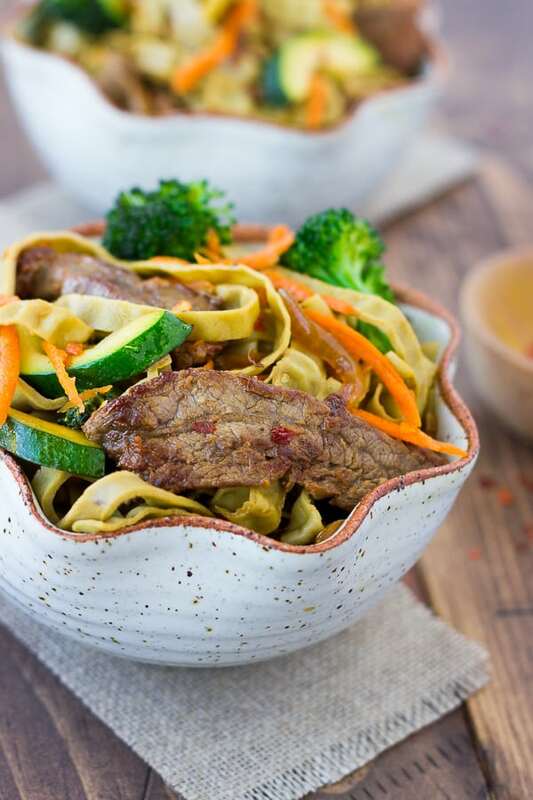 Marinated flank steak, lightly sauteed vegetables, and a flavorful sauce all over tender mung bean noodles. I recently went to a gluten-free expo where I discovered these mung bean fettuccine noodles. (Note: This is not a sponsored post, just my own opinions!) I bought a bag at the expo and fell in love. I also found they sell them on Amazon, which made me fall more in love because Amazon Prime is my life. The noodles are made of only mung beans and water. They also have 20 grams of protein per serving which is pretty amazing! They have a great texture, mild flavor, and are virtually impossible to overcook. I’ve been swapping them in for rice noodles in my favorite Asian dishes. 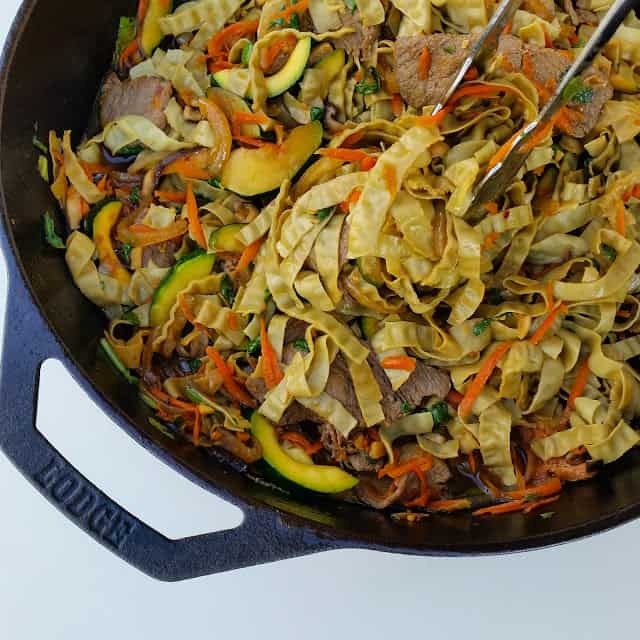 This beef and vegetable noodle bowl has become my family and I’s very favorite! 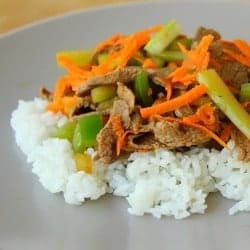 These noodle bowls have marinated flank steak, lightly sauteed vegetables, and a flavorful sauce all over the tender noodles. The combination is so satisfying and incredibly healthy. Plus I love 1-pan meals that can come together quickly on busy weeknights. I’ve made these noodles 3 times in the past month. We just love them that much! 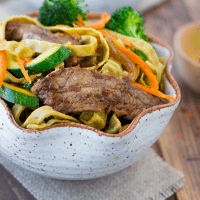 Marinated flank steak, lightly sauteed vegetables, and a flavorful sauce all over tender mung bean noodles. I like to place the steak in the freezer for 20 minutes or so before slicing it. This makes it so much easier to get thin strips. Feel free to add more red pepper flakes if you like it spicier. You can also use rice noodles in place of the mung bean noodles. Place all the ingredients for the marinade into a shallow dish. Add the steak and toss to combine. Refrigerate for at least 2 hours and up to 24 hours. While you cook the vegetables and meat, cook the mung bean noodles according the package instructions. Mix together the brown sugar, vinegar, tamari, and red pepper in a small bowl, set aside. Remove the beef from the refrigerator and pat dry with paper towels. Heat a little oil (I use sesame oil) in a large pan or wok over high heat. When the pan is hot, add the meat in an even layer to the pan and cook without moving for 3-4 minutes, then stir it around and cook for another minute or so until cooked through. Transfer the meat to a bowl. Add a little more oil to the pan if needed, and reduce the heat to medium-high. Add the onion and cook until softened, 4-5 minutes. Add the mushrooms, broccoli, and zucchini. Cook for 3-4 minutes until the vegetables begin to soften. Add the ginger,garlic,spinach, and carrots and cook for about 30 seconds. Add the cooked noodles and meat to the pan. Pour over the sauce and cook everything for another 3-4 minutes until hot. Serve garnished with sesame seeds if desired. Enjoy! These mung bean noodles look great! They look like crinkly thick egg noodles. I often buy mung bean or rice noodles but they are usually clear or white which give them a distinctly Asian feel. I bet these fettuccine noodles could be a good alternative for GF pasta too. They are so delicious! I think they would work well in other pasta dishes too! No need for takeout any more! 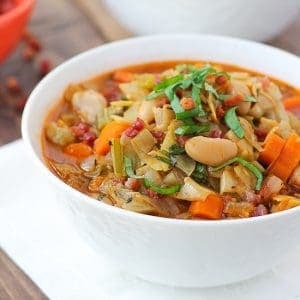 This meal is a FAMILY FAVORITE! It’s so stinking easy to make and delicious.